Find the Pacific Coast blankets featured in many Ritz Carlton ® Hotels here! Many Ritz Carlton ® Hotel guests find that they may new an additional layer of comfort and warmth on their Ritz Carlton ® bedding. When they contact the front desk a luxury Pacific Coast ® down blanket is quickly brought to provide that warmth with a touch of luxury a Ritz Carlton ® guest would expect. 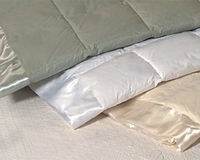 A lightweight fill of down and 2" satin trim encloses these baffle box blankets which really provide the right amount of comfort and warmth for warmer climates and that extra layer of insulation in colder regions. Take advantage of this wonderful Ritz Carlton ® Hotel inspired accent in your tonight!